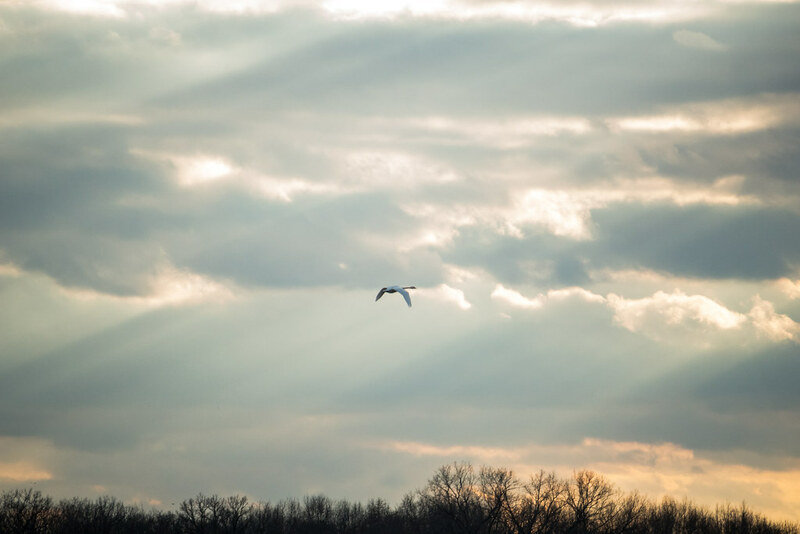 This bird was flying away from me, and the shots only got worse after this one. Can I count on the orange bill here to confirm a mute swan or is there another species that might have this at some point? A knob on the bill isn't apparent, but possibly it's blocked from view? Orange bill looks more like a lighting issue than reality. I wouldn't call this a Mute Swan. The same orange color visible on the bill is also on the neck and wing. That’s what makes it look like a lighting issue to me. Besides, head/bill shape look better for Tundra or Trumpeter. 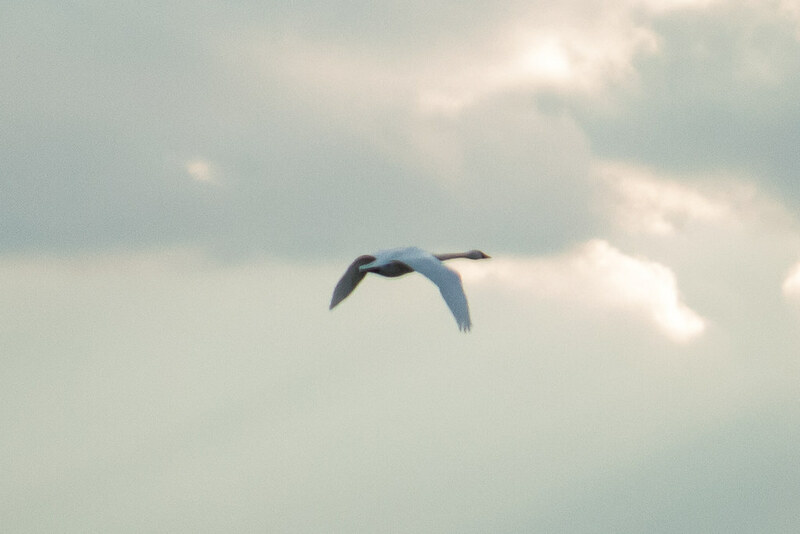 After looking at hundreds of photos on the internet trying to find any swan at all flying into the sunset at the exact angle as mine (and finding none) I am convinced it’s not a mute swan. But whatever it is, that distinct black/orange line has me puzzled, and there’s none of the orange on the head. But that wouldn’t be the first time that happened ha. Also, mute swans aren’t rare around here and are on our checklists. The same orange color visible on the bill is also on the neck and wing. That’s what makes it look like a lighting issue to me. I'm still not going to make a claim on the bird but, disagree with that analysis. The colors are different and, we're looking at lighting affecting a black area and a white area, so that should be different(and is, to me anyway) but also... the zoomed in photo, to me, it looks like the orange that I see on the bill extends into a shaded area on the bill. I wasn’t going to be too specific about the exact shade of orange coloration visible on different parts of the body of a bird in a pixelated photo. The fact that orange color of any description is apparent on the body of any swan should be a dead giveaway for a lighting issue or photo artifact or something along those lines. Furthermore, the presence of orange in areas where no swan species would ever have that color should draw into question the validity of what appears to be an orange beak. All that being said, I don’t feel comfortable identifying this swan to species level. I have no personal experience with Trumpeter, and wouldn’t want to make a call from this angle anyway. I feel that Mute is unlikely because this bird lacks any apparent knob above the bill. Would appreciate any others that want to weigh in with their thoughts.